It was 32C/90F at noon yesterday–HOT! I made a salad for lunch, involving grilled courgettes, cannellini beans, rocket and cherry tomatoes. A bit of a business and maybe on the heavy side considering the heat, but I’d been wanting to make it for some time and it would make a good post I thought. We’d had it before--Meredith even wrote “GREAT!” on the recipe page–I thought I was on safe ground. 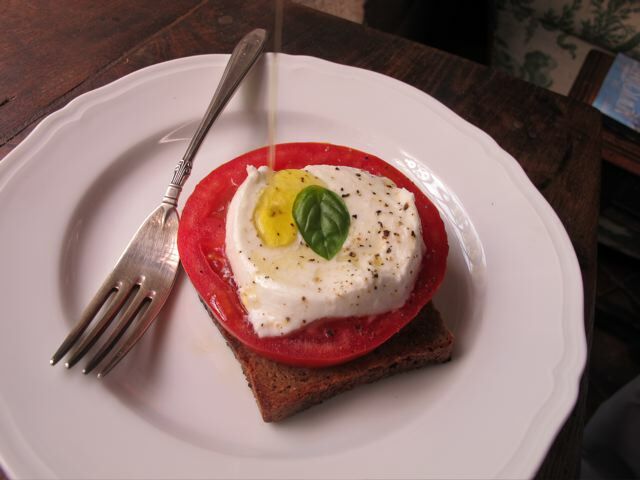 After she’d dutifully eaten half a plateful of the salad, she got up made a piece of toast–with the organic rye I eat–sliced a large wedge of very ripe tomato, placed it on the toast with a pinch of salt and drizzled some of our tuscan olive oil on it. She found the ball of mozzarella I’d bought earlier, sliced a piece similar in size to the slice of tomato and placed it on top. She bit into it and at that moment I knew I’d made the wrong choice for lunch.